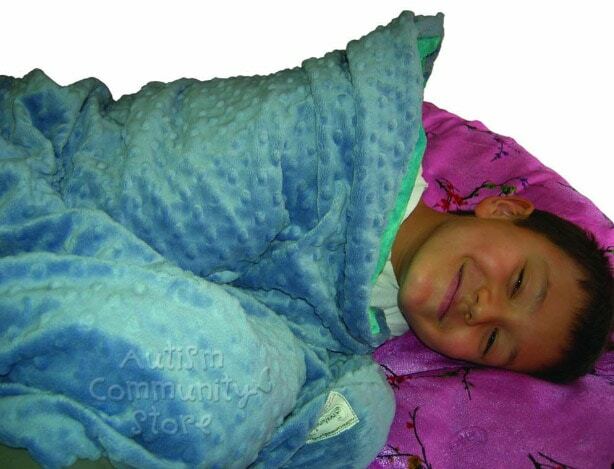 Weighted blankets are a popular companion for children diagnosed with conditions such as Autism Spectrum Disorder, ADHD, Sensory Processing Disorder, and Anxiety. These special blankets help children feel safe during periods of stress, they provide a calming effect, and they improve quality of sleep. Are certain fabrics irritating to your child? Some of these blankets have additional covers or layers of softness to make them feel extra cozy. Make sure you’re choosing a blanket that is the appropriate size and weight for your child. For safety reasons, you typically want to avoid using weighted blankets for children under three years of age. Children who are unable to physically move the blanket on their own, regardless of age, should not be unsupervised while using a weighted blanket. An appropriate starting point is a blanket that weighs 10% of your child’s weight plus one pound. However, caution is advised for younger children. Avoid using full-sized adult weighted blankets for smaller children, it’s not a “one size fits all” product. Weighted blankets are typically filled with small glass or plastic beads to provide an even distribution of weight. For comfort, glass beads are often preferred as they are denser and less bulky than their plastic counterparts. The glass beads can be a little noisier, so ultimately it comes down to preferences and priorities. For all weighted blankets, you want to pick a size to fit your child and not the size of their bed, because weight will be unevenly distributed, or your child will be fighting to keep the blanket on them instead of on the floor. I’ve worked with children professionally for many years and while I haven’t had the opportunity to personally try out all of these blankets yet, I have spent a lot of time researching the many options out there, including which ones to avoid altogether. I’ve picked the very best weighted blankets for kids and compiled the following list to help you make an informed decision. Why: I’m giving the top spot to Quility’s weighted blankets because they make the whole process of choosing a blanket very simple with their selection of sizes and weights. It can feel very overwhelming to shop for a weighted blanket, but finding the perfect one is so rewarding. Children love to cozy up with blankets, and they’ll love it even more when it fits them just right. Material: I appreciate that this blanket is incredibly soft due to the 100% cotton material, and it is filled with non-toxic hypoallergenic glass beads so you don’t have to worry about any sensitivities or allergies. The last thing you want is for your young one to fall in love with a blanket that they’re sensitive to! Each blanket is covered with a removable polyester layer making it ideal for children who don’t like the feeling of being too hot while they sleep. Also, you don’t have to be super careful with it, since it’s easy to clean. Additional Info: If you are nervous about the cost and whether the blanket will benefit your child, this brand offers a 100% satisfaction guarantee and will refund your money with no questions asked. Why: I love how these blankets can be customized to fit your child’s unique personality. 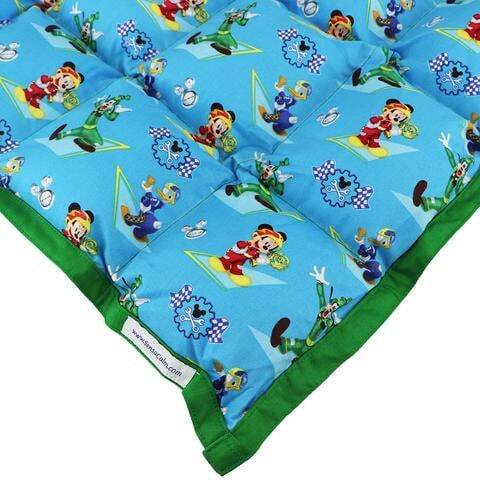 Styles include The Avengers, Star Wars, Disney, and a variety of patterns and colors. This helps your child feel more of a connection to their blanket. These blankets are available in many different sizes and weights, making them inclusive for a wide range of children and their unique needs. Notice how the two highest ranked options are similar in this sense? That’s no coincidence, it’s something that is very important to me. Material: They come in different fabric types, including cotton and minky fabrics. Each blanket is filled with poly-pellets to add weight and optional Polyfil to add a comforting pillow-like feel. The Polyfil also helps dampen the sound of the beads rubbing together, increasing comfort for children with sensory processing disorders. I think it’s great that they offer this as an option, it shows a real understanding of who is using their products. Additional Info: SensaCalm offers a “Cuddle Backing” feature that adds a fleece side to your child’s blanket. Although it is an additional $15, I think its a must-have if your budget permits, especially for children who are more sensitive to touch. 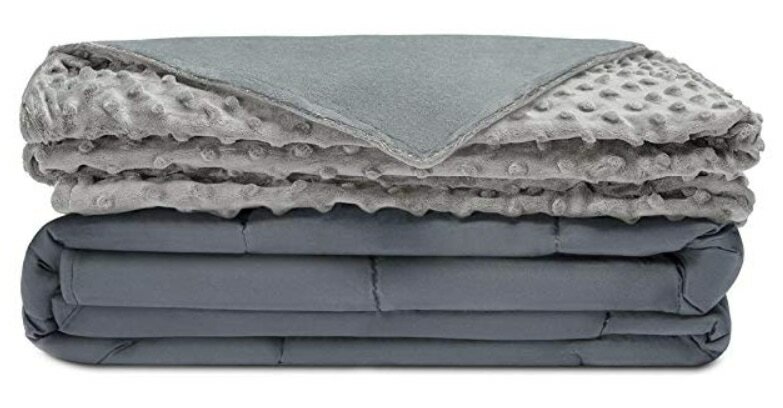 Why: Unlike other weighted blankets, Creature Commforts blankets are filled with organic millet, a 100% renewable, hypoallergenic grain grown in the USA. Millet provides a tactile sensory experience for your child that conforms to their body. Material: The liner is made from 100% premium unbleached muslin that attaches to the cover with ties to stop the blanket from shifting. The easily-washed cover is made from soft minky fabric that feels like a big comfy hug when a child needs it most! Additional Info: Each blanket is handmade in Colorado, USA by a talented team including people on the spectrum, and each purchase helps support the Autism community directly. Why: Harkla blankets help make your child feel secure with the additional use of padding for comfort. Material: These are filled with 100% non-toxic poly-pellets and padding. The cover is made with soft minky fabric that will help relax your child, and the minky dots provide an additional sensory experience. Additional Info: If you purchase your child’s blanket directly through Harkla they will ship it for free (USA) and the company offers a 100% Lifetime Money Back guarantee. I love seeing all of these brands that offer lifetime guarantees to back up their products, that should definitely be a big part of the decision because none of these blankets are cheap, and who would want to be stuck buying a replacement if it gets damaged? 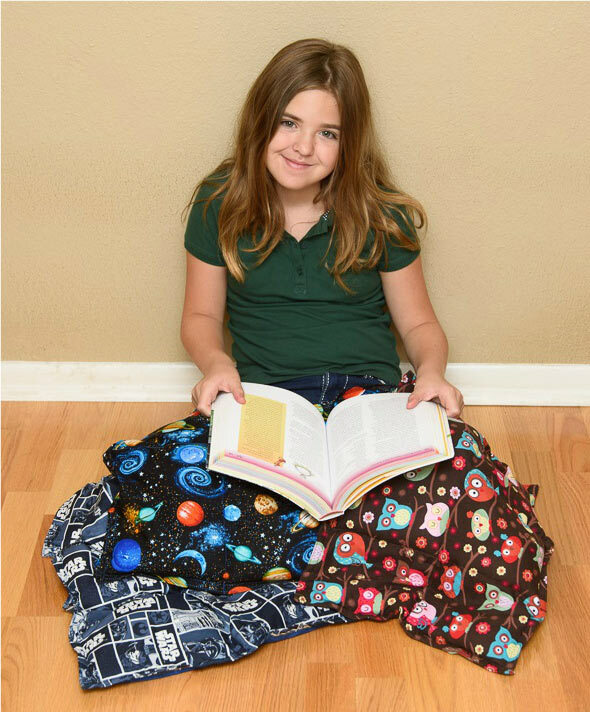 Why: While it’s not technically a blanket, I have included this lap pad because the portable size makes it ideal for school where children might need the calming effects and security of a weighted blanket the most. It has similar benefits as a blanket, but is more practical in some cases. Material: It’s made from cuddly soft 100% cotton and filled with poly-pellets to add a bit of weight. Additional Info: Mosaic provides a limited 1-year warranty covering seam-stitching failure. If the blanket loses any poly-pellets the company will replace the amount lost and repair the blanket for you free of charge. I like this a lot because kids aren’t always careful with their things, so as a parent we get some extra peace of mind, and it’s one less thing to worry about. A guarantee for longer than a year would be nice, but since these are relatively inexpensive to begin with, it’s not the end of the world if you have to replace it… especially if your kid loves it! 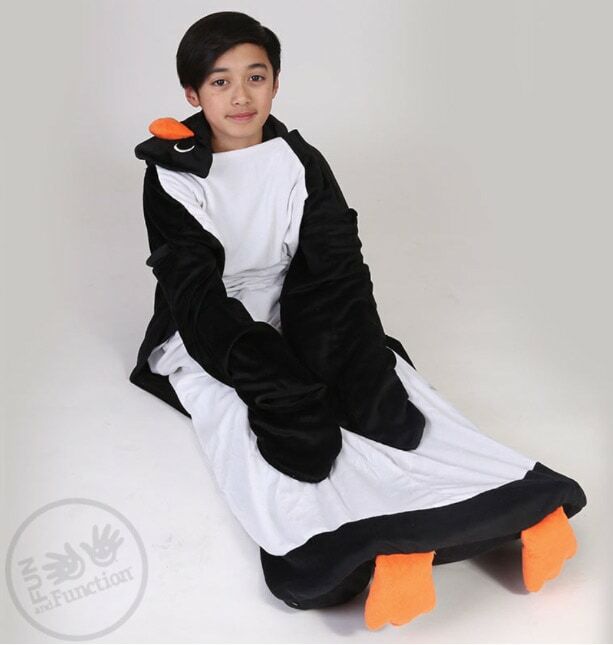 Why: Instead of conventional weighted blanket, this option is designed to look like a cute, cuddly penguin. It only weighs one pound (three pounds if using the removable weights), making it easy for children to wrap themselves up for comfort and security. It’s so adorable to see your little one wearing this blanket! Material: I love the plush polyester fabric that this blanket suit is made from. The removable weighted flippers are made from plastic pellets and add a soothing amount of weight without being too heavy. While they can be removed, most kids like to leave them in. Additional Info: Children can choose to use the weighted flippers to add light compression and to help them feel calm and secure. It gives them a sense of control and ownership.